A successful debut requires making a good impression. A memorable debut can turn that good impression into a great one. In the context of the UFC, sometimes that means taking people by surprise with a flash knockout or methodically picking their opponent apart over the course of an entire fight. Regardless, the easiest way for fighters to catch eyeballs early is to come into their first bout with a decent amount of hype around them. Whether it’s a devastating run on The Ultimate Fighter, a good bout on Dana White’s Tuesday Night Contenders Series or just word of mouth around the mixed martial arts community, living up to high expectations is a good way to give fans an easy reason to hop on the bandwagon. 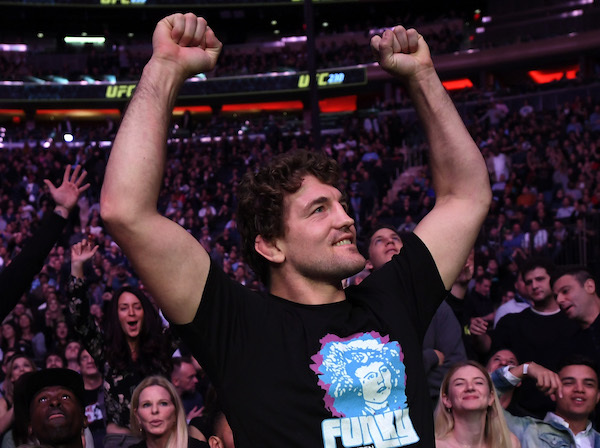 In a little more than a month, Ben Askren gets his shot at making a memorable UFC debut. Few fighters come into the UFC as much noise floating around them as Askren. With an Olympic-level wrestling pedigree, an undefeated record and nine first-round finishes, Askren developed into one of the hottest names not in the UFC. The former Bellator and ONE FC welterweight champion received even more buzz when he was traded for longtime UFC flyweight champion Demetrious Johnson. On top of the “wait, what?” responses that came from learning promotions could trade fighters, the fact Askren was worth trading one of the most dominant UFC champions ever upped the hype around the former Olympian. Even though Askren said he doesn’t really have a chip on his shoulder, he understands how the fight game works. The day the UFC announced the trade, he subsequently called out most of the welterweight division (and lightweight champion Khabib Nurmagomedov) all in one tweet. One guy he didn’t name was former UFC welterweight champion Robbie Lawler, who Askren will fight at UFC 235 in March. The bout is Lawler’s first in more than a year and represents a big name for Askren to take on in his debut. “Really excited to fight Robbie Lawler,” Askren told UFC.com in November. “(A) good test right off the bat, a former champion. Someone who some people think is going to be a tough matchup for me, so I’m excited for the challenge. Now that he is in MMA’s largest promotion, Askren said he is excited to fight higher-ranked athletes for the first time in a while, and he has continued his desire to fight welterweight contender Colby Covington. “Nobody likes Colby. Literally nobody,” he said. “Not just in the fake world on social media and Twitter because social media and Twitter, that’s kind of a fake universe. It’s not really reality. But in the real world, nobody likes Colby. He doesn’t have friends. I don’t even know if his mom likes him. Nobody likes this guy, me included. Until then, however, he is continuing his preparation to fight Lawler in Las Vegas. Should everything go his way that night, you can bet his Octagon interview will include a few more call outs and many more people following what the 34-year-old will do in the UFC. A member of the 2008 United States Olympic Wrestling team, Askren said he talks to double champions Daniel Cormier “fairly frequently” and Henry Cejudo “once in a while,” and said both men are thrilled for him to start his UFC journey. If Askren does indeed carry the same intangibles as Cejudo and Cormier, he could be a multidivisional force to be reckoned with. But first, he has to take care of that debut.